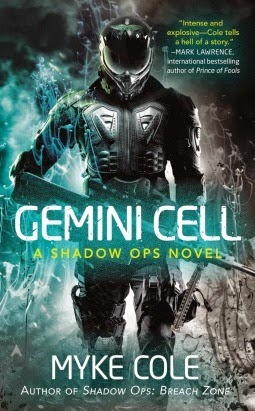 Gemini Cell is a prequel to Cole's Shadow Ops trilogy. I have to say I quite enjoyed Gemini Cell. It's a big departure from the 'contemporary fantasy/sci-fi/romance' I usually read. I had my eye on the others in the series and when this one came up I grabbed it. Blunt and very violent in places, the story was well tempered by the relationship between Jim and Sarah. For me, she was much the main character as Jim. She isn't a typical military wife which is, why I think, she has so much appeal. This book has tons of gritty, in your face action, conspiracies and heart wrenching moments. Even reading the blurb, I was still pleasantly surprised by how MUCH went on. To be honest, the bulk of what I read is fantasy and sic-fi romance. Because of this, the biggest point of tension for me was Jim and Sarah's forced separation. For me, as much as Gemini Cell is a fantastic paranormal-military read, I was more than satisfied with the very human relationship Jim and Sarah had and my need to root for it was well supported throughout the book. The only thing that might hold me back from continuing with the series is price. As I said I've had my eye on the other books in the series and while they aren't exorbitantly expensive, they are more than I usually spend.